Bleh, between the cold and my job suddenly going from two days a week to five I haven’t been very active here on the blog, sorry. Todays post is a sort of follow-up to my last post on buying locally. I am a JRPG fan. For those unfamiliar with the term, that means Japanese Role Playing Game. They are role playing games with anime styled characters and the sort of crazy twisted storyline you expect from anime as well. You usually have to sink around 100 hours into them to play the whole game, which makes them serious value for money too. Because I live in Australia video games cost ball-park $100 (sometimes as high as $120 or as low as $70 for a new release), so you want that value. Some of my favourite games are the Persona series, the Final Fantasy range and the Atelier series. The sad part is some of the best games never even make it to Australia. Because Australia has a smaller population than America we similarly have a smaller number of buyers for a niche market like JRPG’s. I always buy my games from Australian stores to try to support the Australian JRPG market. I want Atelier Meruru. 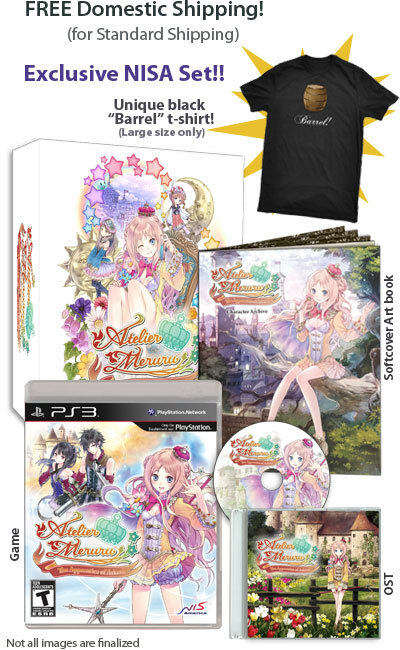 More importantly, I want the collector’s edition of Atelier Meruru. I don’t care if you call it limited edition, collector’s edition, premium pack or game with extras, I want it. And yes, I know the shirt will be ridiculously huge but I will wear it anyway. The problem is they won’t release it in Australia. The game will come out here, but only the standard edition and only enough copies to cover the first couple of weeks of sales. Sure, I could buy it from one of those stores that imports the game from overseas, but I’m still not supporting the Australian market. Those stores import from America or the UK, meaning they purchase from that country’s market, bolstering their numbers not ours. Also, it’s usually cheaper if you’re going to get an import game to just buy it yourself from Ozgames or Play-Asia. So here comes the conundrum, do I buy the game on its own and support the Australian industry – which may mean in the future we might get these collector’s editions afterall – or spend the same amount of money(ok, $10 more with postage, but damn close) to get the collector’s edition imported from overseas? Picture of Atelier Meruru Collector’s Edition unedited from the NIS America Store. When it comes to something produced overseas that is an individual thing, like an RPG, I don’t see how buying it overseas can harm the Australian market. It’s unlikely to be imported here, like a lot of good anime. However, if it’s something like books, clothing, homewares etc, things that are bought and sold by local merchants, then yes, I agree that we should buy local as much as possible. I know, being down to one income(for the family) has forced me to really carefully pick and choose what to play. I’m hoping that since I bought the collector’s edition from the NIS store directly they’ll consider it as a purchase for the Aussie market and perhaps consider making it available here next time.